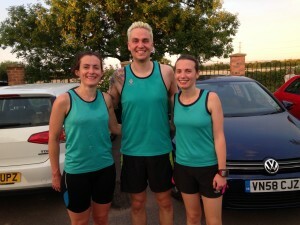 A one hour drive to Gloucestershire did not stop three keen BvHers from going down to the fourth in the series of the ‘White Horse 5k’. Emily Holden, Laura Leslie and me (Paul Gorman) made the trip, with Stuart Leslie also with us to shout encouragement. If you have never done this race before, it is a really friendly 5k organised by Severn AC, and is a four-race series over the summer. 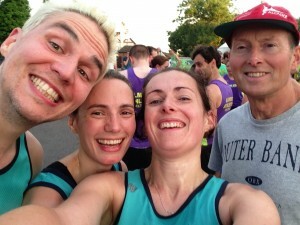 It is a great, fast road course, with lots and lots of very good club runners to drag you along. I highly recommend it, as it was my first time and I thought it was great. It was also the Gloucestershire Championships on the same night, so the field was even stronger than usual! Our great team spirit led to some good BvH results, with Laura picking up 5th female spot, Emily getting a new PB and coming in as first FV35, and me knocking 29 seconds off my 5k PB. The results announcements were great, with old-school prizes from a vast biscuit selection, which included ginger nuts and jammie dodgers for the winners. The lead guy ran 15.24, so he had the pick of the bunch! These were also presented by the mayor and mayoress of Gloucestershire, which was an unexpected surprise. Even more of surprise, was that the first round of applause was for the kind woman who unblocked the men’s toilet! The venue and the runners were very grateful, as you can imagine. This entry was posted in 5k, Race Reports by Records & Rankings. Bookmark the permalink. Great running guys. I hope to give this a go next year too, sounds like a good event.